1. What are Euler Diagrams? Leonhard Euler (pronounced “Oiler”) was one of greatest mathematicians of all time. Many people claim he was the greatest. One of his lesser known inventions is Euler diagrams, which he used to illustrate reasoning. An Euler diagram is shown above. One of the common interpretations of Euler diagrams is that of set intersection. With this interpretation, the above diagram uses areas to represent sets A, B and C. The diagram also includes areas for the intersections AÇB, AÇC, and AÇBÇC. No area represents the set (not A)ÇC and so the set C is entirely contained in A.
Visually, Euler diagrams consist of contours, drawn as simple closed curves. The contours split the plane into zones. A zone can be identified by its containing contours. In the diagram above, the contours are labelled A, B and C and the zones A, B, AB, AC and ABC are present in the diagram (as well as the outside zone which is contained in no contours). Here we associate with each zone a label formed from the contours within which it is contained. This section shows a few examples of where Euler diagrams can be used. Often, Euler diagrams are augmented with extra structures, such as dots, labels or graphs, showing information about what is contained in the various zones. One significant feature of Euler diagrams is their capacity to visualize complex hierarchies. Above is a picture indicating that some animals are in more than one classification, such as “dog” and “cat” which are both pets and mammals. It is not easy to show this sort of relationship with the more usual tree based hierarchical visualization of classifications. VENNFS takes this Euler diagram approach to visualizing file system organization. It allows files to appear in more than one directory in a computer file system. propose using Euler diagrams to visualize large databases using multiple classifications. The original application of Euler diagrams, as a way of diagrammatically demonstrating logic, is widely used in schools, where they are a great aid to teaching set theory. More academic work includes Hammer , who introduced a sound and complete logical system based on Euler diagrams. More expressive reasoning can be achieved by extending the diagrams with graphs. Shin developed the first such formal system. This was extended to Spider and Constraint diagrams by the Visual Modelling Group at the University of Brighton, along with others. An example constraint diagram is shown above. These enhanced Euler diagrams can be seen as hypergraphs, and as such, it should be possible to apply visualization techniques for enhanced Euler diagrams more generally to applications that use hypergraphs. The shape of contours may be restricted to certain shapes such: as circular, oval, rectangular or convex shapes. Triple points may not be allowed, so that only two contours can intersect at any given point. Only transverse contour intersections may be allowed, so that lines cannot touch without crossing. Concurrent contours may not be allowed, so a line segment cannot represent the border of 2 or more contours. Euler diagrams or Euler circles are a diagrammatic means of representing sets and their relationships. They are the modern incarnation of Euler circles, which were invented by Leonhard Euler in the 18th century. Euler diagrams usually consist of simple closed curves in the plane which are used to depict sets. The spatial relationships between the curves (overlap, containment or neither) corresponds to set-theoretic relationships (intersection, subset and disjointness). Euler diagrams discriminate the well-known Venn diagrams which represent all possible set intersections available with the given sets. The intersection of the interior of a collection of curves and the exterior of the rest of the curves in the diagrams is called zone. Thus, in Venn diagrams all zones must be present (given the set of curves), but in an Euler diagram some zones might be missing. In a logical setting, one can use model theoretic semantics to interpret Euler diagrams, within a universe of discourse. In the examples on the right, the Euler diagram depicts that the sets Animal and Mineral are disjoint since the corresponding curves are disjoint, and also that the set Four Legs is a subset of the set of Animals. 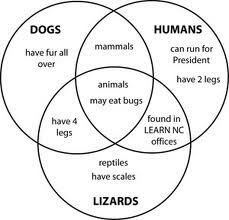 The Venn diagram which uses the same categories of Animal, Mineral and Four Legs does not encapsulate these relationships. Traditionally the emptiness of a set in Venn diagrams is depicted by shading in the region. Euler diagrams represent emptiness either by shading or by the use of a missing zone. The terms Euler diagram and Venn diagram are often confused. Venn diagrams can be seen as a special case of Euler diagrams, as Venn diagrams must contain all possible zones, whereas Euler diagrams can contain a subset of all possible zones. In Venn diagrams a shaded zone represents an empty set, whereas in an Euler diagram the corresponding zone could be missing from the diagram. This means that as the number of contours increase, Euler diagrams are typically less visually complex than the equivalent Venn diagram, particularly if the number of non-empty intersections is small. Note: Due to some problems diagrams are not shown in the text, go to the references for details. The diagmms are not displayed here by some reasons. To see the diagrmmes used in please go to the mentioned links.